Flecked with golden pearlescence, this pampering toning lotion removes surface impurities while it perfects skin's surface, smoothing, softening and refreshing. Luxuriously silky, it leaves skin with an invisible veil of moisture and helps maintain the optimum moisture balance. Prepares your skin to get the maximum benefit from the rest of your Re-Nutriv skincare. Use AM and PM. 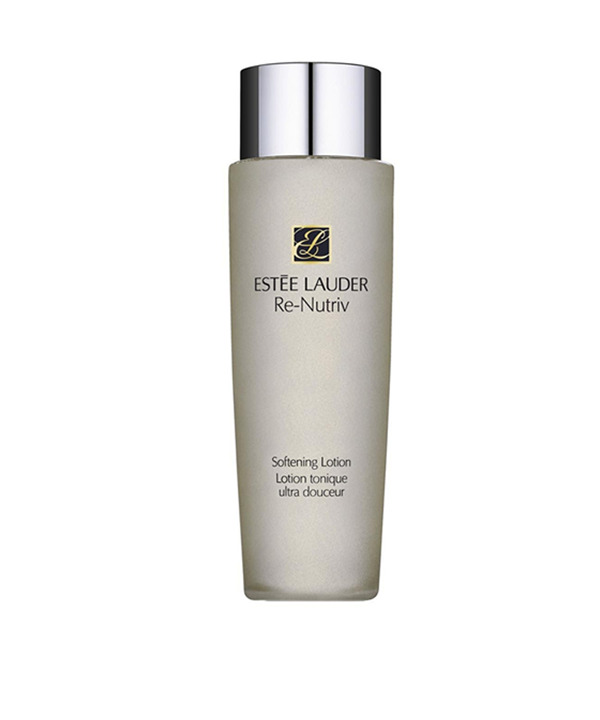 After cleansing with Re-Nutriv Creme Cleanser, sweep the Softening Lotion over face with saturated cotton ball. Follow with the rest of your Re-Nutriv ritual. Water\Aqua\Eau; Polysorbate 20; Acetyl Glucosamine; Yeast Extract\Faex\Extrait De Levure; Camellia Sinensis (Green Tea) Leaf Extract; Adenosine Phosphate; Hordeum Vulgare (Barley) Extract\Extrait D'Orge; Pantethine; Triticum Vulgare (Wheat) Germ Extract; Cholesterol; Squalane; Linoleic Acid; Sodium Hyaluronate; Glycerin; Hydrolyzed Wheat Protein; Gold; Caprylyl Glycol; Acrylates/C10-30 Alkyl Acrylate Crosspolymer; Silica; Tromethamine; Polymethylsilsesquioxane; Hexylene Glycol; Fragrance (Parfum); Disodium Edta; Phenoxyethanol; Caramel; Titanium Dioxide (Ci 77891); Mica; Red 33 (Ci 17200) . Please be aware that ingredient lists may change or vary from time to time. Please refer to the ingredient list on the product package you receive for the most up to date list of ingredients.